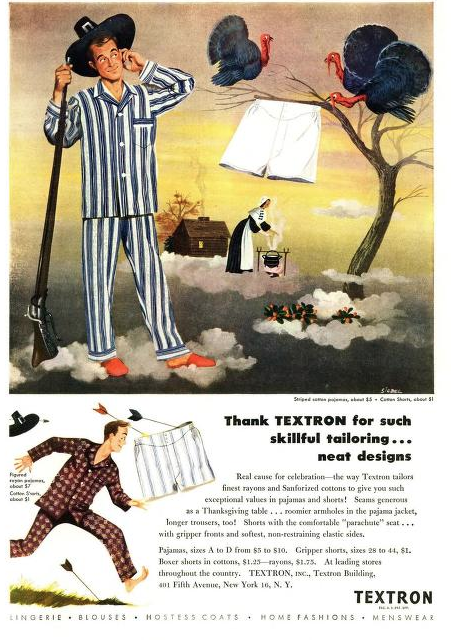 Textron was started by a 22-year-old in 1923 to manufacture synthetic yarns. It wasn't until 1953 that they started becoming a conglomerate, today with many defense equipment subsidiaries. So says Wikipedia. The theme of the ad reminds me of the Groucho line, "Last night I shot an elephant in my pajamas." I'm sure he's not but it looks like he's talking on a cellphone. Looks to me like he's a Secret Service agent checking in (why do they always touch their earpiece when they're talking?). Rayon pajamas and rayon bed sheets. I dare you to remain on the bed all night. He's head-scratching, because he recognizes the opportunity to shoot the Mrs. and claim he missed a turkey.